Chad Leroy posing with the Galletta's Greenhouse #7 at the Galletta's 2007 Klassic (9/23/2007). Raced the Galletta's Greenhouse #7 in the 2007 Klassic, his first show at Galletta's. Showed great improvement between his first and second races. 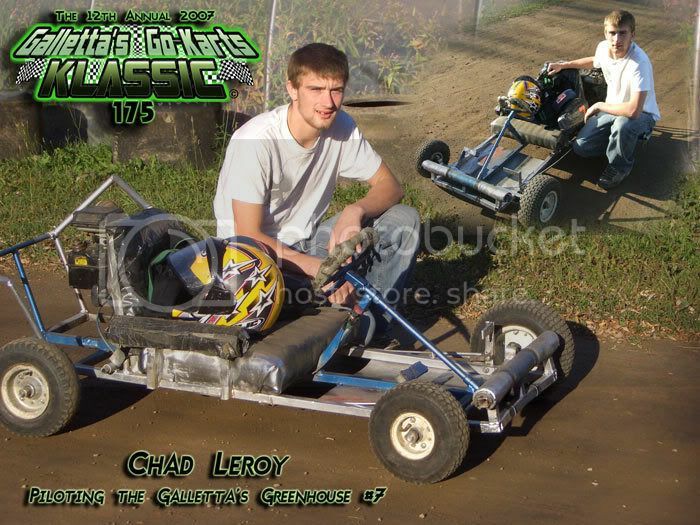 Was nicknamed "The Lethal Weapon" by his Coleman Racing teammates after his part in the accident that forced Ogre into an early retirement mid-way through the 2007 Galletta's Kart Klassic due to broken bones.